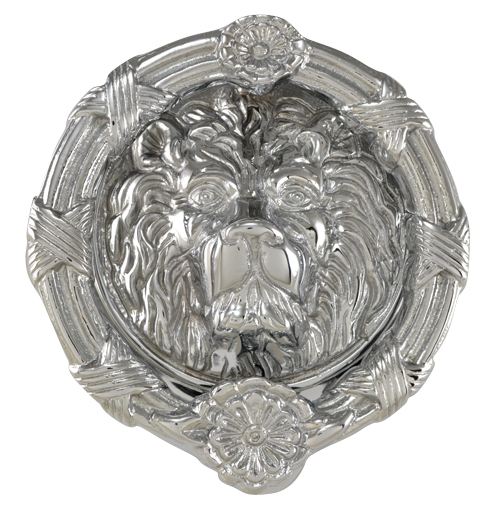 This door knocker is made from solid brass and it measures 5 1/4 inches across and it is also available in a larger version. Mounting distance is 4 1/2 inches. This knocker has a three-bolt rear mounting to secure this to your door. The Lost Wax casting process insures a high level of detail. The lost-wax casting process, sometimes known by the French name of cire perdue is an ancient practice that is still used for artwork today and it is used to preserve the fine details of the original door components. This is available in polished brass, antique brass, oil rubbed bronze, polished chrome (shown), brushed nickel and polished nickel.